Visit any online running community or attend a run club meeting and one thing will be made very clear. There are a lot of opinions and information circling the running community about running shoes. Some attribute all injuries to their shoes, changing shoes the moment they feel any ache or pain. Others have been told by running store salesmen that they need a specific shoe to add support, due to their flat arches or to reduce pronation. It can be difficult to sift through the information and find the truth. Runners simply want to know: what running shoe is best for me? 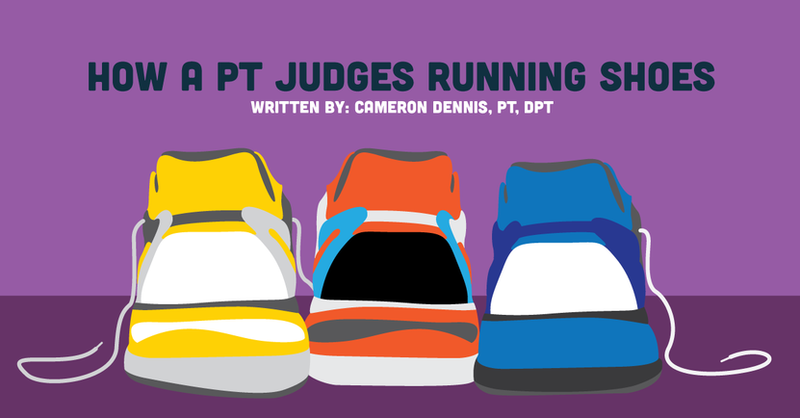 There are several points to consider when giving recommendations for running shoes as a physical therapist. Where can we find the truth, as physical therapists? Peer-reviewed research is a fantastic source of information and can guide us to the truth when it comes to what running shoe is best for our patients. It was once believed that those with low arches should wear “motion-control” shoes which are designed to be more rigid. Those with a more neutral or “normal” arch should be placed in “stability” shoes, and those with a high arch should be placed in more cushioned, “neutral” shoes. Despite common “knowledge” in the running community, selecting a shoe based on arch-height does not lead to reduced injury (1). Another misnomer commonly used for shoe prescription indicates that excessive pronation of the foot and ankle leads to injury, so shoes should be fitted to reduce pronation. Current research is inconsistent and conflicting but has not shown a strong correlation between “excessive” pronation and injury (2, 3). Pronation or foot posture can not confidently be used as an indicator for shoe prescription, barring further research. What about “minimalist” shoes? Once again, not enough research has been completed to confidently say that wearing minimalist shoes leads to reduced injuries. Minimalist shoes are designed to mimic running barefoot, resulting in a foot-strike closer to forefoot (4). This “strike-pattern” is linked to reduced forces placed through the tibia and knee. Also, running barefoot actually has been shown to reduce ground-reaction forces through the leg, when compared to running with neutral shoes (5). As discussed, much of the “common knowledge” about running shoe selection is either false or has little evidence to support it. So, what is the best way to recommend shoes? Ask the patient what has worked well for them in the past. If a certain model has been comfortable for them in the past and has not led to increased pain, this is likely a good place to start. However, if a patient has used the same type of shoe for several years but has been plagued with injury, it may be time to consider a different type of shoe. Some people respond well to minimalist shoes, while others don’t. Some respond well to neutral shoes, while others don’t. Find out what your patient has used in the past and go from there. Clinical tip: It’s important to note that pain or injuries can occur if suddenly shifting from a neutral shoe to a minimalist shoe. The muscles of the foot and ankle will require time to adapt to the reduction in support. Mileage should be limited when first attempting to transition to minimalist shoes or barefoot running. Not all shoes are created equal. As with any product manufactured on a large scale, defects will be present in a certain percentage of the shoes. These defects can be minor differences from one shoe to another but can have a big impact. Several quick tests can be done to screen for defects and potentially prevent problems in the future. This leads us to the last consideration when selecting a running shoe for your patient. As with many runners, the perceived success or failure of the shoe will come down to whether it leads to pain or injury. However, the fact remains that sometimes a runner will have pain no matter what shoe they’re running in. As therapists, we must be able to discern when the equipment is the problem versus when training errors are to blame for pain or injury. Use your best clinical judgement. Do your research on various brands to gather your own thoughts and opinions, so that you will feel confident the next time your patient asks you what running shoe is best. There are many factors to consider when choosing a running shoe, and unfortunately it’s not as simple as recommending a single brand or certain type of shoe (minimalist versus neutral versus motion control, etc). After a thorough examination of the research, it’s also not appropriate to select a shoe based off arch height or in effort to reduce pronation. In the end, it comes down to asking what’s worked in the past, what feels comfortable, and making sure that the shoes your patients are purchasing are of good quality. What recommendations do you give to runners for selecting the best shoes? Have you had good experiences with certain brands or types of shoes? Leave a comment below to share your thoughts! Knapik JJ, Trone DW, Swedler DI, et al. Injury reduction effectiveness of assigning running shoes based on plantar shape in Marine Corps basic training. Am J Sports Med. 2010 Sep;38(9):1759-67. Nielsen RO, Buist I, Parner ET, et al. Foot pronation is not associated with increased injury risk in novice runners wearing a neutral shoe: a 1-year prospective cohort study. Br J Sports Med. 2014 Mar;48(6):440-7. Neal BS, Griffiths IB, Dowling GJ, et al. Foot posture as a risk factor for lower limb overuse injury: a systematic review and meta-analysis. J Foot Ankle Res. 2014 Dec 19;7(1):55. Altman AR, Davis IS. Barefoot running: biomechanics and implications for running injuries. Curr Sports Med Rep. 2012 Sep-Oct;11(5):244-50. Hall JP, Barton C, Jones PR, et al. The biomechanical differences between barefoot and shod distance running: a systematic review and preliminary meta-analysis. Sports Med. 2013 Dec;43(12):1335-53.